For once, everything in October “Toby” Daye’s life seems to be going right. There have been no murders or declarations of war for her to deal with, and apart from the looming specter of her Fetch planning her bachelorette party, she’s had no real problems for days. Maybe things are getting better. Because suddenly Toby’s mother, Amandine the Liar, appears on her doorstep and demands that Toby find her missing sister, August. But August has been missing for over a hundred years and there are no leads to follow. And Toby really doesn’t owe her mother any favors. Then Amandine starts taking hostages, and refusal ceases to be an option. "For once, everything in October “Toby” Daye’s life seems to be going right." - I knew that wasn't going to last. Poor Toby rarely catches a break. Besides, it would be a short book if there wasn't a conflict or catastrophe. :D The book opens with Toby's bachelorette party which was a hoot to read. But, In no time, Amandine shows up on Toby's doorstep and makes a request/demand. And oh boy, Amandine plays dirty. She is not nice. I didn't remember her being quite so cold or vicious in her earlier appearances. In "The Brightest Fell", she is queen bee bi*** and delights in rubbing Toby's face in it. One again, McGuire pulls threads from earlier stories and weaves them into a new design, making you question what you believed and what you thought you knew. She even did something I thought was nearly impossible: she made me like, and feel sorry for, Simon Torquill. She started on that in the prior book but brought it to fruition in this book. Mind you, I still disagree with his choices but I understand them better now. Much of the book revolves around family, the family we're born with and the family we make for ourselves. McGuire examines these ties and shows us just how binding they can be, even when we want to turn our back and walk away. Certain characters were missing and others had reduced roles and were missed, but McGuire worked magic with the remaining ones. The story was tight, the characterizations excellent and I was veering between crying and cheering with the occasional urge to pith my Kindle across the room. Toby goes right to her breaking point and I was seriously worried about her future. McGuire is evil; she needs to stop beating up and Toby and the gang! I know I'm being vague but so much happens and I really don't want to accidentally spoil anything. 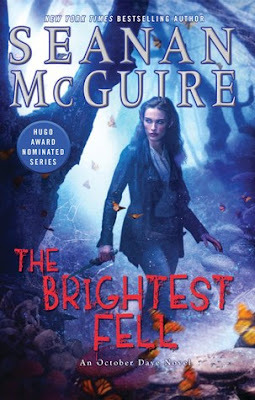 "The Brightest Fell" is a strong wrenching story, with twists and turns, pathos, humor, love, anger, and moments that made me gasp, curse, and read furiously. If you're new to the series, skip this book and get the first book, "Rosemary and Rue". This series simply must be read in order. You won't regret it. Come back on September 7th for Laura's review and a giveaway. Angels are bright still, though the brightest fell .—William Shakespeare, Macbeth. This one is new to to me, but it does sound good. I love when an author caused you to care for a character that you never though would be possible. Oh, I hope you try this series. It's a wonderful telling of a woman navigating the faerie world and the modern world, finding family, and the decisions we make and their consequences. And yes, I would have sworn McGuire couldn't redeem the big bad villain Simon Torquill but she did it.